These steamed mussels are insanely tasty and quite frankly, ridiculously quick! 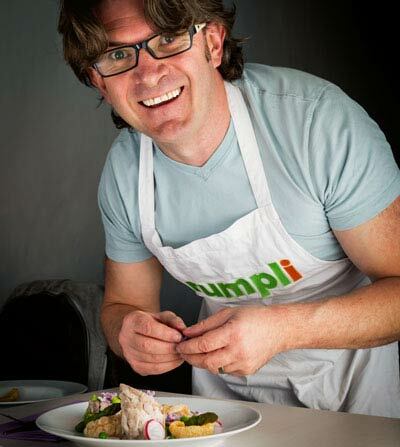 Don’t worry if you are new to cooking mussels, I’ll hold yer hand! Beer Steamed Mussels With Chili. What am I saying top 10, seriously throw in Mackerel and you have my top 5! You may be able to sense my excitement about this recipe and you are right. 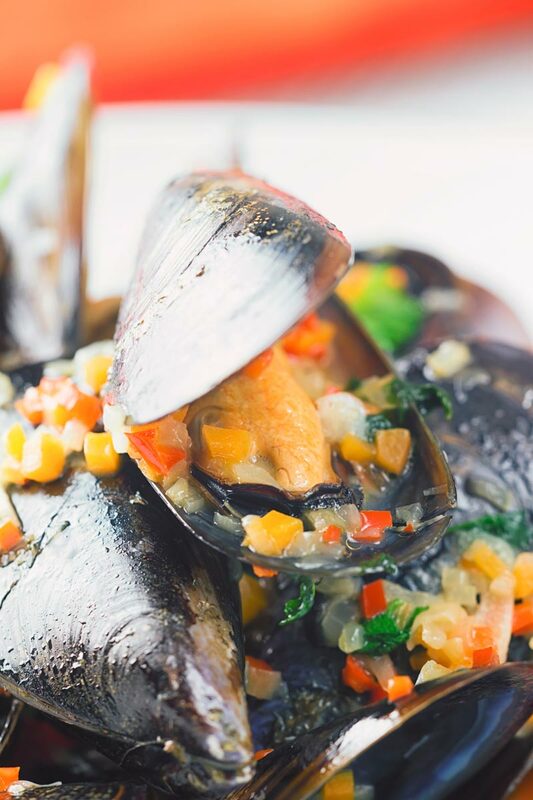 Mussels are a rarity here in the Hungarian countryside and I’ll not go into details on the difficulties I had in finding the main ingredient for this recipe. But if you have 15-20 minutes and access to good mussels then cook this mussel recipe. Your belly, your eating partner/partners and the universe will thank you! Living in landlocked Hungary puts me at a disadvantage when it comes to sourcing seafood. These beer steamed mussels are the first here on Krumpli and will likely be the last for a while. However, I do have a jolly good collection of Shrimp Recipes. 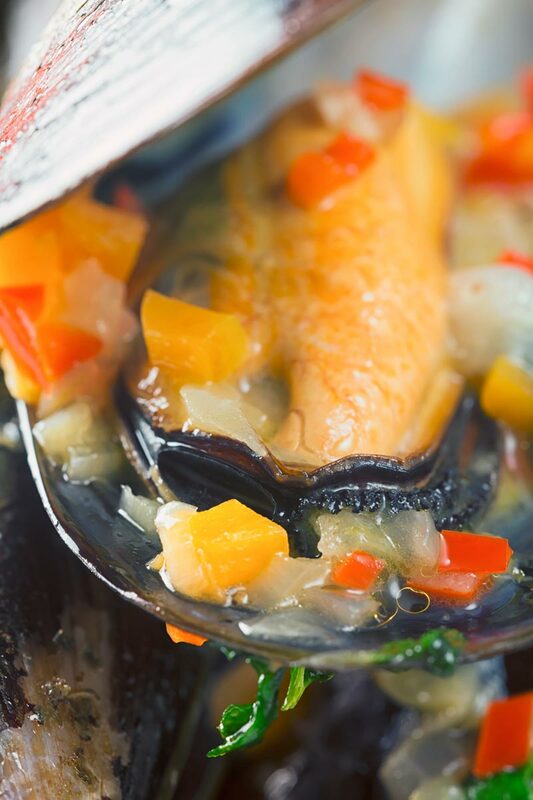 All of which share the same speedy characteristics of this speedy mussel recipe. Hot and Sour Shrimp Soup. Depending on where you have sourced your mussels they can be a pain. However, if they are not cleaned then doing so is not difficult, just time-consuming. You need two things a knife and some patience. Long gone are the days of soaking mussels, most of our mussels are now cultivated and do not require soaking. The first thing we need to do before we start these steamed mussels is to discard any broken mussels. Then discard any dead mussels, they are easy to spot, they will be open. Dig them out and give them a firm tap on the table, if they do not close put them into the bin. Now you are ready to clean, take your knife and use it to pull any stringy bits, the beard, back towards the hinge. The hinge is the pointy end. After you have cleaned your mussels you are ready to cook them. The key to cooking mussels is not to overcook them because they will turn in to rubber pellets. For me, there is only one way to cook mussels and that is to steam them. So into a hot pan they go with some aromats, then add a lid. After that some booze to get the sauce going with the natural juices. A bit of butter, some herbs and that is it, you are done. Apart from any more of those dead suckers… This time around they will remain closed. If you see any after cooking throw them into the bin. 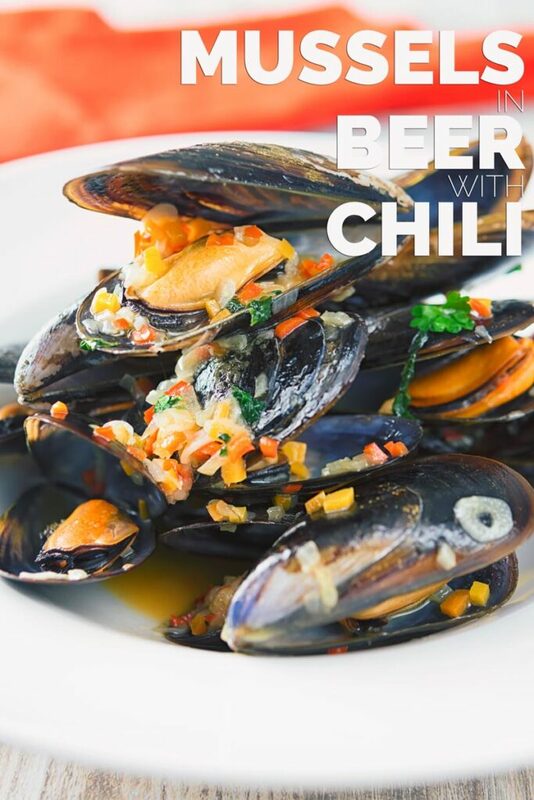 The ingredient list for these Beer Steamed Mussels make me go all 'Sound of Music', they are very much a list of my favourite things! I LOVE this recipe! 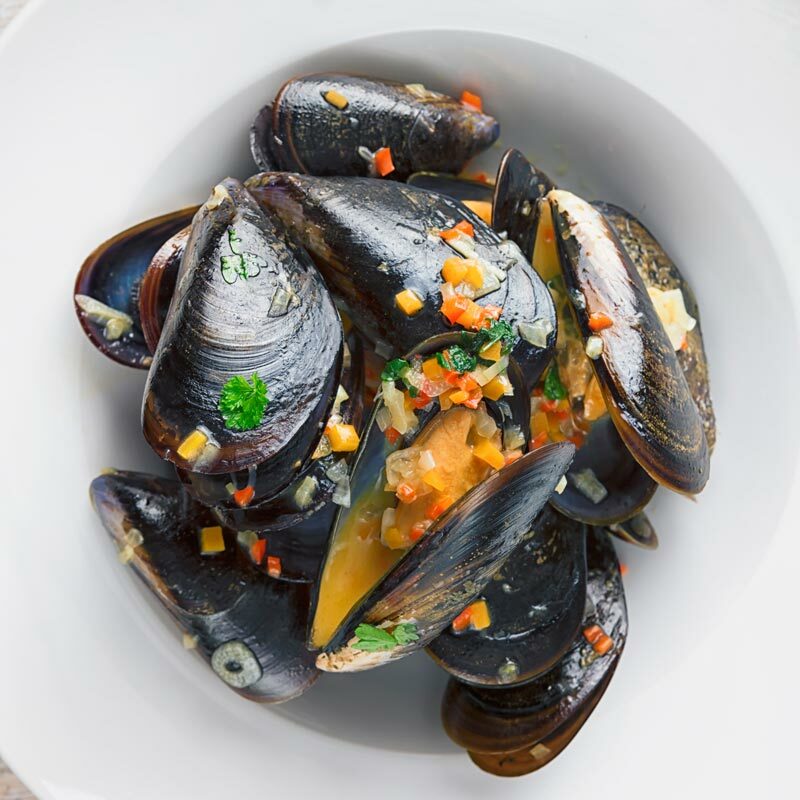 Place the mussels in water and clean them, scroll up for detailed instructions on how to do this. Finely dice the chili, carrot and shallot. Pick the parsley from the stalks. Heat a wok over a high heat (or other pan with a lid). When hot add the oil followed by the shallot, chili and cook for 60-90 seconds. Drain the mussels and add them and the garlic to the hot pan and immediately add a lid. Cook for a couple of minutes seconds shaking a couple of times. Remove the lid and pour in the beer and reduce by half and then return the lid and cook for another 90 seconds. Strain the mussels through a fine mesh sieve catching the juices in a bowl. Return the cooking liquid to the wok and boil hard for 30 seconds, then add the butter. When the butter has meted stir, add the parsley and mussels and serve. If you buy well cleaned mussels your prep time should be minimal, however if you buy mucky mussels then be prepared to spend some time cleaning them up! I use a Belgian wheat bear called Leffe Blonde, the choice of beer will massively change the flavour of the dish have a play and let me know your favourite combinations. That sounds great. What kind of beer do you use? I love mussels so much. Never tried to add beer to the sauce. This recipe sounds absolutely great, will definitely have to try it. 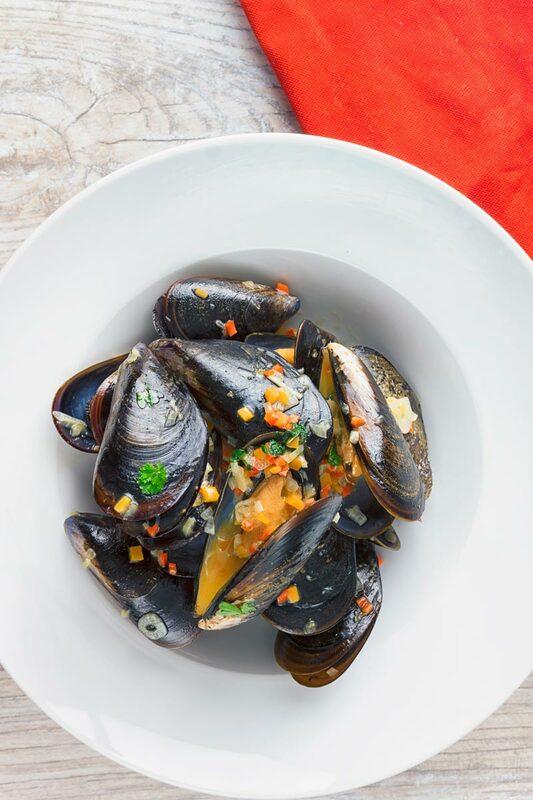 Your pictures are so gorgeous I just want to lick my screen, I love mussels to bits and am always ready to try a new way to cook them, can’t wait to make mussels your way! Haha, thanks Patty, enjoy, I love this recipe! I love a nice spicy sauce for mussels. The chili is the best in this recipe with the beer! Love it! I love mussels so much! I bet they taste amazing steamed in the beer- so much flavor in it. Can’t wait to try these. They sound delicious! I think mussels go beautifully with chilli and I’m sure you enjoyed these – especially after managing to get them in the first place!